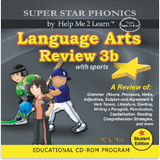 Featuring young adult characters and sports games to engage students in fundamental language arts skills, Language Arts Review 3b will appeal to middle school, high school, and adult students. It is especially appealing to to students who require lots of action and activity to keep their attention: from stock car racing to hot air balloons, pole vaulting to archery, and even hockey, bowling, and baseball, our games give immediate feedback to students on their progress. Language Arts Review 3b may be used as an alternative to Phonics 3b for wider grade levels. It features the Gold Medal Motivational and Data Tracking system, which encourages students to earn bronze, silver, and gold medals by completing each lesson. Want To Tell A Friend About Language Arts 3B!! !